The results are in for 2018’s “Best Places to Work in Virginia,” and 14 Henrico County businesses have risen to the top. This year’s list showcases the companies that have successfully tapped into Henrico’s highly skilled workforce and shown the innovation required to retain top talent in an increasingly competitive environment. The list is developed by Best Companies Group, which surveys employees from participating companies annually and ranks the top competitors within three size categories. Its rankings are based on criteria like leadership, culture, training, compensation, and engagement – with the results published in Virginia Business magazine. This year, 175 companies vied for inclusion on the list. Among those that made the cut, 14 are either headquartered in Henrico or have a strategic location in the county. From financial services to transportation to engineering, law, and staffing firms, these businesses are a great representation of the diversity of industries in a county that’s home to more than 25,000 businesses and four Fortune 1000 company headquarters. This year, several new Henrico organizations have joined the ranks of Best Places to Work, while others repeat as best in their industry. According to Virginia Business, a common theme among this year’s winners was company policies aimed at helping to reduce workplace stress – like casual dress codes, flexible schedules, and allowing employees to bring their dogs to work. Once again, Henrico’s companies continue to evolve and adapt their policies and workplaces to match the expectations of new generations of talent. The distinction of these businesses as Best Places to Work reflects Henrico County’s winning combination of a skilled workforce, excellent quality of life, and dynamic business climate. 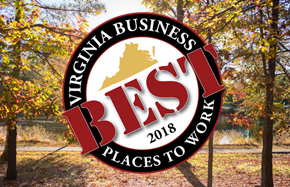 See the full list of 2018’s “Best Places to Work in Virginia” here.